LA Pavers is a professional landscaping firm specializing in the design and installation of custom outdoor living spaces for Louisiana clients for years. We have completed many such projects all over Harahan, Mandeville, Covington and Slidell, LA. Our skilled manpower is ready to take on your project and create your long-wanted landscape features. Got questions for us? Just call 504-731-8755 and our friendly staff will be happy to answer your queries on the outdoor living features that we build. Outdoor kitchens rank as among the most desirable additions in any property, whether private or commercial. They not only make outdoors more functional by extending the indoor kitchen, they also serve as perfect venues for family bonding and socializations with friends and neighbors. The goal of every property owner must be to have well-appointed, stylish, and durable outdoor kitchens. This can be achieved with various amenities to ensure that you’ll have everything you need to prepare your specialty meals and desserts. You may choose from custom cabinetry, heavy duty grills and ovens, oversized sinks, refrigerator/freezer, mini bar, and outdoor furniture/dining set. An outdoor fireplace is a welcome addition to any Louisiana landscape, more so when it has accessories included. You have the option to have a portable and or a built-in fireplace that uses any of these fuels: natural gas, gel, wood, or propane. Additionally, you may pick from any of the common fireplace materials such as clay, steel, cast iron, and aluminum. Your desired outdoor fireplace can be placed in strategic areas including the garden, pool deck, patio, view deck, and other outdoor living features. Fire pits are cost-effective fire features that can make your stay comfortable even during chilly weather. There can be a small fire pit in the middle of the garden or a large one complete with accessories in the pool deck area or patio. Fire pits must be custom designed to be fully functional and responsive to clients’ peculiar needs and requirements. It should also be installed on your desired location so you can spend time outdoors in total warmth and comfort. 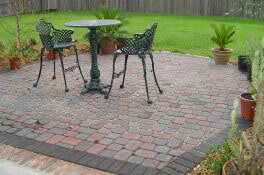 Patios are easily among the best outdoor living features that any property owner can possibly have. They can be the stand-alone type or attached to the home for utter convenience. Professional installers guarantee exclusive use of premium materials from trusted partners; be they brick pavers or natural stones. It can be enclosed so you can use it all-year round, or open so you can enjoy more sunlight and outdoor breeze during your stay.